I'm still finding interesting shots to process from my time in Chicago. From Salvage One, this is the back of the bar, a collection of random sign letters set in front of a glass block window. It was a tricky photo to figure out how to make into a good composition. I'm still unsure I did it well. With so many apps now for iPad, one can spend as much time (or more!) working with an image as in Photoshop, I think. In the end, I settled on a black and white image to make it more silhouette-y. 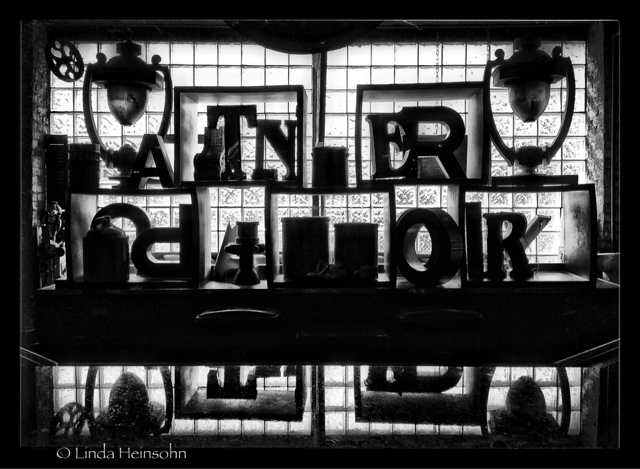 Then I added a "moonglow" layer and a grain layer to make the glass brighter behind the letters.